Running in Reno, Nevada. Best routes and places to run in Reno. 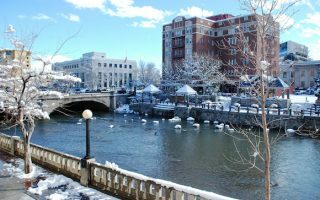 Located in the western part of Nevada, Reno is known for its hotels and casinos, as well as being the gateway to the Lake Tahoe area. The terrain and setting is unique, as Reno sits at 4,500 feet in a high desert at the foot of the Sierra Nevada range. 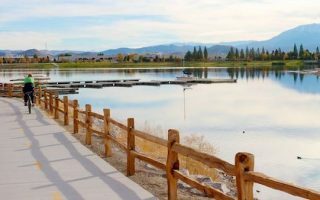 For a relatively small city, there is an excellent variety of running in Reno, from long paved bike paths to loops through wetlands and some great intro trail running. For some long off-road running, the two best bets are the 12-mile paved Truckee River Path, and the gravel Steamboat Ditch Trail. 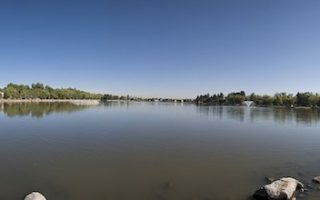 For lake loops, try Virginia Lake and the Sparks Marina. 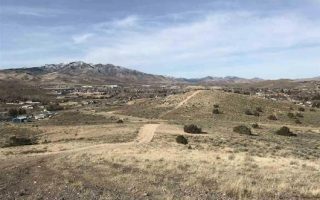 We also love some of the gentler trail running options at Ranhco San Rafael Park, Huffaker Park, and Damonte Ranch Park. For some hill work on untrafficked roads, head north of Reno to the Golden Valley area. Those who enjoy trail running have countless options in Reno and vicinity. A few notes about running in Reno. At 4,500 feet, the altitude is a factor — use the right cautionary measures. In summer, it can be hot and the high desert terrain means most of the routes are very exposed. 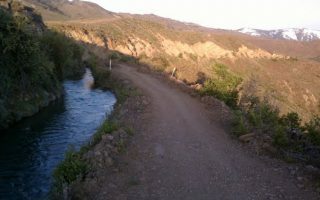 In winter, there can be rain and snow, affecting the surface of the off-road trails. The best opportunity in Reno for a long, continuous, relatively flat off-road run. 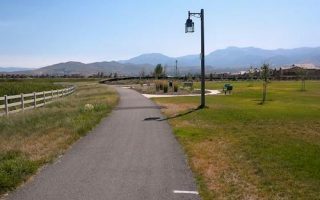 The 11-mile paved path is along the Truckee River and features river views, marshes, and a greenbelt featuring several parks. Table with segment distances. 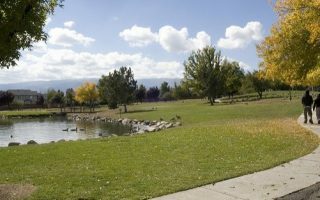 The 2 mile loop around the Sparks Marina Park Lake makes for a pleasant run, with good water and mountain views. Sparks is a town just 5 miles east of Reno. Popular lake for swimming in warm weather. Hilly and scenic trail running in this park built on a former ranch. And it's only 1 mile from downtown! Several 1-2 mile loop trails, on a variety if terrain, from sagebrush to wetlands. A wide, gravel path following an irrigation ditch for 6 miles is one of the best spots in Reno for a longer off-road run, on rolling hills. Start at Horsemans Park, 5 miles south of Reno, and head west as long as you like! A pleasant, flat off-road run containing featuring some nice views. The trail is almost exactly 1 mile around the circumference - so you might have to do a few laps to get in some miles! Just 2 miles south of downtown Reno. Great opportunity for some easier trail running. 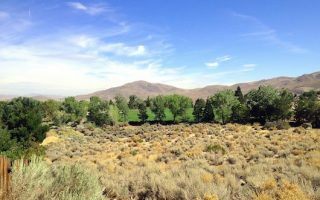 The Huffaker Park Lookout Trail is a 1.7 mile loop that surrounds the two hills, and features great views of the valley, Truckee Meadows, and the mountains of the Virginia and Carson ranges. One of the best flat off-road running opportunities in Reno. A 3-mile paved trail circles around a wetlands area, featuring great views. The trail has spurs to some of the surrounding residential area. Good opportunity for some hilly running on untrafficked roads north of town. Once you reach the end of the paved section of Estates Rd., there are miles of dirt roads where you can create your own challenge! 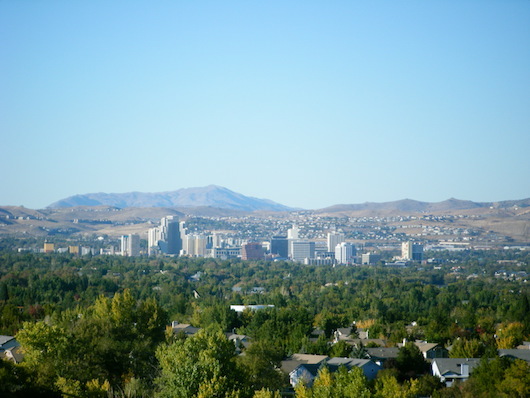 Reno’s climate is sunny and dry, averaging 300 days of sunshine a year. Summers can be hot – with average high temperatures near 90F (32C). Nights cool off to near 50F in July, so a layer is always needed when traveling to Reno! Spring and fall are fantastic for running, with less extreme heat. Winters are cool, with average daytime highs around 45F (6C), and nights that cool off into the low 20s (-6C). Keep in mind that Reno is at 4,500 feet and the terrain is exposed. Reno averages 13 days of rain annually — nearly all of it in winter — and 21 inches of snowfall. Note that trail conditions can be affected by rain/snow/cold temperatures in winter. Eclipse Running. Fantastic running store since 1994. Near Virginia Lake loop!. Group runs Saturdays 7am from store. Also great resource for running groups and race/event calendar. Group run and Reno event calendar. Eclipse Running has links to all sorts of local resources for running in the Reno area. Northern Sierra Endurance Training has more for runners of all types than its name indicates, including several group running — and walking — options. A great bet is their Saturday 7am group run from the Eclipse Running store. Good calendar of running events in Reno. Also here.